Growing up in the urban center of Honduras, Gloria Morazán Salgado has witnessed the conflict of a rapidly developing country struggling to sustain natural resources while addressing extreme poverty. 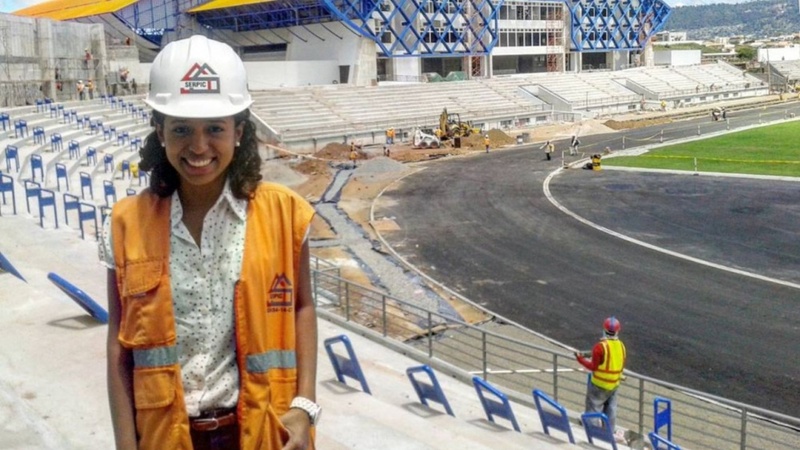 She spent five years as an architect for a construction company in Honduras before deciding to return to school to focus on sustainable development. Last fall, she started working towards a master’s degree in architecture through the College of Design at UO Portland as a Fulbright scholar — a highly competitive merit-based U.S. State Department program that encourages and funds international educational exchange for scholars, students and teachers. The experience and knowledge Salgado gained as an architect, in combination with her interest in the environment, guided her to move to Portland to pursue graduate work in sustainable design. “The field of study in sustainability is limited in Honduras and is just starting to develop,” Salgado said. Her research focuses on the future of cities and how to face urban conditions like rapid urbanization with a sustainable approach, to develop projects that help, rather than hinder, the health of the planet. Salgado grew up in Tegucigalpa, the urban capital of Honduras known for its beautifully preserved Spanish colonial architecture and surrounding lush landscape. The urban hub of Honduras provides more opportunities to its inhabitants than other parts of the country due to its advanced development. “Living in a developing country and encountering the reality of those that live in poverty made me appreciate how blessed I am, and at the same time motivates me to contribute in the development of my beloved country, a place that is full of kind people who keep their optimism even when living in extreme conditions,” she said. Salgado has been applying her experiences in Tegucigalpa to her studies and research in Portland. One concept she is focused on is the idea of compact cities and how to bring nature and green spaces into urban areas. Portland is often cited as an ideal sustainable city because of its attention to sustainability and greenery, which makes it a good place to study sustainability and architecture. Coming from Tegucigalpa to Portland has been a huge change for Salgado. Salgado sees sustainable development as something necessary and inherent if humans want to successfully progress, and she hopes to someday utilize the power and diverse possibilities of sustainable development in Honduras. Global transition into sustainability is imminent, inevitable and increasingly necessary, she said.